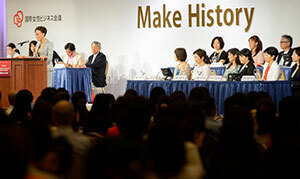 The theme of the 20th international conference was “Make History”. The clock is ticking. From 1 April 2016, firms in Japan with more than 301 staff—as well as central and local governments—will be legally required to draw up action plans to promote women’s career-related activities. These are to include the creation and disclosure of numerical targets on the hiring of women, and women’s appointment to executive positions. While there are no penalties if targets are not reached, experts have suggested that fear of damage to public image caused by failure to do so may be sufficient motivation for firms to succeed. The new legislation, which is part of Prime Minister Shinzo Abe’s work to create “a society in which women shine”, is designed to boost female participation in the face of a shrinking and ageing population. Yet, according to a panel of business people at the 20th International Conference for Women in Business held in Minato Ward on 26 July, it is not only government and firms that have a role; women have a crucial part to play. Addressing more than 100 delegates on the topic “Who Gets Promoted, Who Doesn’t, and Why?”, panellists said women need to refrain from assuming traditional gender roles at work and being afraid. Instead, they need to have the self-confidence to understand their value, ask questions and sell themselves. “Women need to work harder globally to get promoted”, said Shie Lundberg, head of consumer support, Asia Pacific, at Google Japan Inc., adding that women tend to be overly humble. “If you have success or an achievement, celebrate it with your manager. Men strike up career conversations about advancement and promotion [with their manager] four times more than [women] do”, she said. 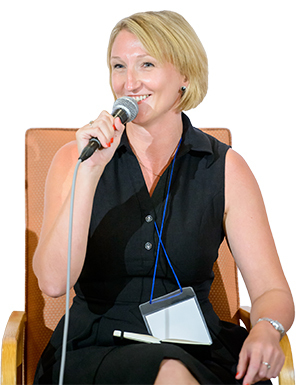 Lori Henderson MBE, executive director of the British Chamber of Commerce in Japan, said that during her 12 years in the country she has noticed behaviour by women in meetings that may hold them back. “Don’t be small”, she said. “Own your space at the table. It is harder as a woman to be noticed in Japan, or maybe you are noticed for the wrong reasons; show that you are an equal player”. 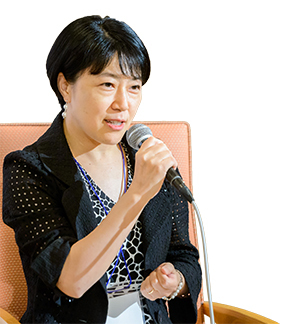 Moderator Yoko Ishikura, president emeritus at Hitotsubashi University, agreed, adding that women have a tendency to sit at the back or on the edge of the action. This want of assertiveness is something Sachin N Shah, chairman of MetLife Insurance K.K., has noticed. “Females lack the self confidence to take the big step, allowing themselves to think big about their career. “Have a vision; aim high”, he said. “In Japan, if we want to change the dynamic of more women in leadership roles, we need more women to have more credible experiences than men. That means you have to be thinking about not just the promotion, but also the experiences you are gaining, so over time you are becoming more valuable”, he added. Creating these experiences, alongside the development of staff, is needed to diversify the pipeline of candidates and the talent pool, Shah said. Every month, in MetLife, senior executives match employees to management job openings, regardless of gender. Since the firm began this system 18 months ago, the number of women in management has risen from 11% to 14%, while female executives have increased from 10% to 20%. “Senior leadership controls what happens in middle management”, he said. “Its about process discipline and long-term thinking. It’s not about quotas”. Delegates raised a broad range of issues, and panellists shared their experiences of promotion. “Even though I was doing the same things, saying the same things, immediately after I got the title of team leader, my opinions, my views, gained weight within the organisation”, said Mitsuru Claire Chino, executive officer at Itochu Corporation. Describing herself as “more empowered” because she can now see the bigger picture of where the firm is going, Chino said she was oblivious of her upcoming promotion and why senior men at her firm were so nervous at that time. Henderson encouraged delegates to find out the promotion cycle and power structure of their firm. “Ask”, she said. “By asking, you are planting the seed for your future promotion. People around you will understand that this individual is ambitious; this individual wants to be promoted. Be a vocal advocate for yourself”. Responding to a question on what to say when asked to give a reason for your promotion request, Henderson said understanding that takes a lot of self-reflection. Giving a personal example, she said: “I want to give a platform to people who don’t normally get a platform. That includes women in Japan, LGBTQ [lesbian, gay, bisexual, transgender and questioning] groups, people with disabilities—particularly on the way to the Olympics and Paralympics—and foreigners”. Lundberg said three things affect a chance of promotion: will, skills and availability. Writing concisely to avoid wasting the reader’s time and speaking well builds credibility, while preparing your group to function without you means your boss can promote you without fear of anything falling apart, she said. Speaking in a session entitled “Women’s Advancement Overseas”, Rosemary McCarney, president and chief executive of Plan International Canada Inc., said women might be at a disadvantage because their CVs are not understood. “I don’t think women’s careers are as linear as [those of] their male counterparts”, she said, adding that there may be gaps or periods of slow change because of childbirth or caring for elderly parents. “Evaluators—who are mostly men—are not sure how to evaluate them because they are not predictable; they are not the norm”. Yet, the overwhelming message of the speakers was that women and young girls should not be disheartened by the status quo. “Don’t try to follow men’s rules”, said Ishikura. “As long as we are rule takers, we are never going to be rule makers”. Haruno Yoshida, president of BT Japan Corporation, also considered this point in her address. “Women are expected to appear on centre stage today as they are”, she said. “Don’t try to be anyone else”. 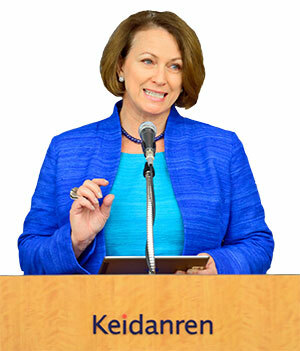 When approached in February by the Keidanren (Japan Business Federation) to become the first female board member, vice-chair of the board of councillors, Yoshida asked the reason. “Mr Sakakibara [chairman] asked me to breathe fresh new air into the organisation, to invigorate and bring energy”, she said. She called on working mothers to “keep on working. Give it 100%. That will set the flame for those who will follow on from us”. Throughout the conference, which attracted more than 1,200 people from 35 prefectures and abroad, delegates were encouraged to make history, which is this year’s theme. 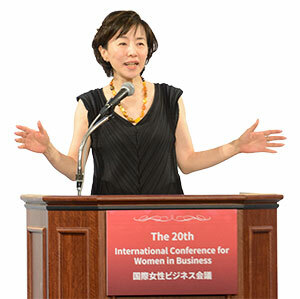 “The theme ‘Make History’ is all about making one road”, said Kaori Sasaki, founder and chair of the conference. “We want society to have one main road for us all to walk on”. More then 20 years ago, when Sasaki made approaches to the business world about having such a conference, she was told it was not needed; it would be a waste. But she was not deterred. “I thought, if a lot of women are working for these types of corporations, I need to do a conference”, she said. Sasaki celebrated the successes of the events to date, as well as their future potential. The 20th conference attracted delegates from business, government and academia, ranging in age from junior high school students to those in their seventies. About 10% of attendees were men. Topics—including leadership; male championship; artificial intelligence; sport; women’s reproductive cycles; lesbian, gay, bisexual and transgender staff; negotiation skills; regulatory reform; investment; and management—were debated by more than 60 expert speakers from a range of fields. “You have so many courageous women in this country”, said Mohau Pheko, the South African ambassador to Japan and one of 28 government representatives in attendance. “Somebody needs to stand up and be a little bit daring and a little bit cheeky in order to move an agenda for them. This does not require huge throngs of people. It can be in small spaces that bubble out. “There is power in Japan”, she said. One woman who is making history is Inga Beale. On her appointment as chief executive of Lloyd’s of London in January 2014, she became the first woman to hold the position since the firm was founded in 1688. Women had been banned at Lloyd’s for almost 300 of those years. “When I started my career in insurance over 30 years ago in London, I was one of very few females in the City, the financial district of London”, Beale told an audience at the Keidanren on 25 September. “And women weren’t allowed to wear trousers”. Beale was not career-focused until senior management told her she had potential. She encouraged women to believe in their ability and be confident, citing three essential elements for career development: performance (do a good job and get feedback), image (consider how others perceive you) and exposure (to people and situations within and outside the organisation). She recalled her acceptance of a position at the headquarters of GE Insurance Solutions in the US after 19 years of working in London. “It was a scary thing to do, but I was given the opportunity and I took it”, she said, adding that people need to be flexible, take chances and have courage regarding their choices. Role models have been important to Beale in her career. During a backpacking trip around the world, she worked in Australia, in an office in which the boss was a woman. “She was respected—and she wore trousers”, Beale said. “It showed me that women could get ahead, and they could do that best by just being themselves. “I’ve learnt in my own career that quietly getting along with work is just not enough”, she added. She called on women to be bold. Part of that, she said, is about knowing your value. “I think sometimes [the gender pay gap exists] because we as women don’t know to ask. When it comes to discussing their own salary, [women] are generally less demanding than men; they often think other things are more important in a job than money”. Beale said a diverse and inclusive workplace brings a range of skills and viewpoints that help firms think differently, challenge the status quo, and innovate. As part of that ethos, Lloyd’s held its first market-wide collaboration celebrating diversity and inclusion, Dive In, over four days from 29 September. It engaged 34,000 people in London’s insurance market with an education programme and a celebration of diversity.